Printed Sermons Click the title to open a PDF copy. Note, printed sermons require Adobe Reader to open. If you do not have a copy, click Download. Download Adobe Reader for Free. God Just Isn't Being Fair! Note: If you have found these reflections illuminating, helpful, or comforting, and if you would like to be a part of our continuing ministry, you can do so by forwarding a contribution in the form of a check made out to First Community Church -- Message Ministry. 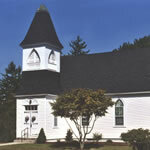 Our mailing address is 137 Southville Road, Southborough, MA 01772. Your donation is greatly appreciated and is also tax deductible. We wish you blessings and peace.